With infertility being a growing concern among couples, the scope of a rewarding career in the field, has grown considerably. Qualified and skilled professionals in this field are the need of time, for successfully performing various procedures in ART (Artificial Reproduction Techniques) and other associated technologies. MSc in Clinical Embryology and Pre-implantation Genetics is one of its kind course, with a studiously designed curriculum which prepares the students to take up embryology and other advanced work in hospitals or centres offering IVF treatment. It is the only course around the globe which offers the development of specialised skills in pre-implantation genetic diagnosis and clinical embryology. 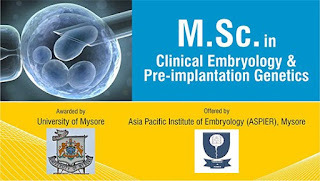 Recognised under the University of Mysore, the course is accepted worldwide and is offered at Asia Pacific Institute of Embryology, Mysore. With a duration of 2 years, the course is divided into four semesters of 6 months’ duration each. The curriculum involves a syllabus on clinical embryology as well as PGD and emphasised intensive hand on skill development sessions. The course intends to equip students handle clinical embryology needs and researches with efficiency. They are also intended for practising embryologists to enhance and upgrade their knowledge while equipping them to meet the proposed regulatory requirements in the new ART bill. The eligibility conditions for this post graduate course is a pass in Bachelor of Science degree or equivalent like any of the following. The course is offered at the directorship of Dr. Suresh Kattera, the world renowned clinical embryologist, well known for his expertise in ICSI and other related fields of ART. The master program in Clinical Embryology and Pre-implantation Genetics at ASPIER is well known for its eminent international and national faculty. Guest lectures and seminars from pioneers in the field help provide an exposure and world view of the current trends to the students.